The UN does not normally intervene in the internal matters of member countries. KUCHING: The United Nations (UN) office in Kuala Lumpur struck a cautionary note when activists from Sarawak handed it a Peoples’ Petition which was signed in Miri on Aug 9 by activists in Borneo. This was disclosed by Lina Soo, the President of Sarawak Association of People’s Aspiration (SAPA), in a statement issued in Kuching after her return. “We had useful discussion with an UN officer who indicated that the UN does not normally intervene in the internal matters of member countries,” said Soo. However, she also learnt there may be exceptional situations where it may be possible for the people to raise issues directly with the UN. Furthermore, in exceptional situations a member country may call for investigation of serious issues arising in another member country on behalf of the people who may not have “standing” to bring their case, she added. Apparently, the Petition was presented to the UN office in KL to keep it informed. The full Petition will be delivered to the UN headquarters in New York after it has been signed by at least 300,000 people in Sabah and Sarawak. The signature campaign has begun in both states and is expected to be completed before too long. 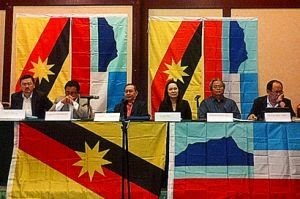 The Petition calls on the UN to review the arbitrary manner in which Britain had surrendered Sarawak and Sabah to the Federation of Malaya on 16 September 1963 to be absorbed in a renamed Federation called Malaysia. The current Peoples’ Petition is an effort to revisit the original petition for self-determination submitted 52 years ago by Brunei, Sarawak and North Borneo political parties to the UN and accepted for hearing in mid-December 1962 before the world body. However, the delegation abandoned the journey to the UN after the outbreak of a rebellion in Brunei on December 8 1962. There’s some suspicion that the Brunei rebellion followed the instigation of British secret agents for an excuse to crush all opposition to their Malaysia Plan.